Saturday, 8/11 marked another successful cleanup at the Delridge Triangle! We hit an all-time record of volunteers coming as far as Admiral to show their community spirit by pitching in at Delridge Way SW/18th Ave SW/SW Barton St, as well as surrounding blocks. The cleanup was a joint effort between the South Delridge Community Group (SDCG) and Friends Of The Delridge Triangle (FDT). Burger Boss Drive In kindly sponsored the event with free meal vouchers for all participants. This is one step of a greater project in the works to redevelop the Triangle into a safe and usable community space where the neighborhood can socialize and play. 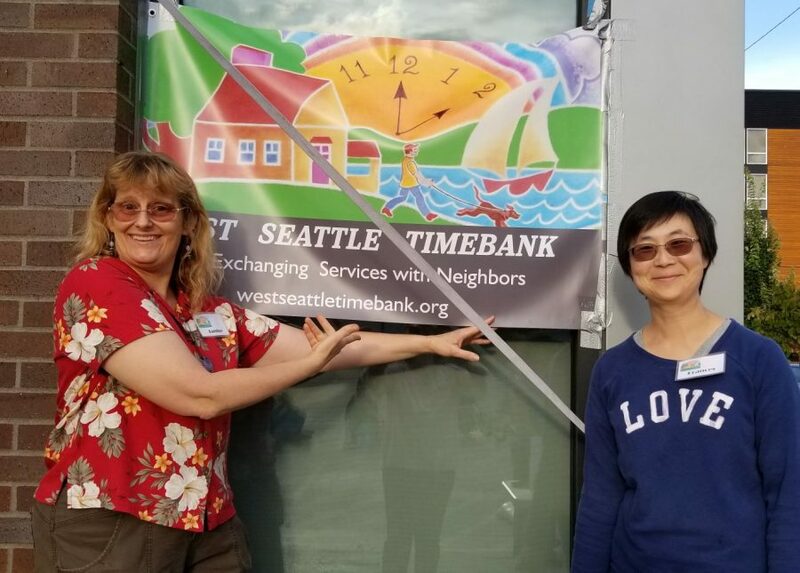 The Friends of the Delridge Triangle was recently awarded $41k through the Neighborhood Matching Fund to start a community engagement process for a Phase 1 redesign of the space. The redesign phase will run start September and run through Spring 2019. The community is invited to have their voices heard and participate in the project. sdelridgecommunitygroup@gmail.com or visit our website. To receive project updates and information how get involved with the Delridge Triangle redesign project contact Friends Of The Delridge Triangle @: delridgetriangle@gmail.com or visit our website. Late last night someone stole our small crab vessel belonging to the Alki Crab Club from the 2200 block of Alki Ave SW. A small trolling motor and two life vests along with paddles were taken as well. The boat was a Sears 12 foot aluminum boat named “the Sea Beach” painted blue and white with green lettering. Reward for its return to the Alki Crab Club. Thanks! Our neighbor also reports that his paddle board was stolen from his yard last week as well. 1985 Honda Elite 80 scooter taken from the parking strip across from Holy Rosary office. It had been parked in front of Holy Rosary since Tuesday until my mechanic could come out to replace the wheel. He moved it across the street to the parking strip, took the wheel off, and when he went to get a part, it was taken. Steering was locked and the rear wheel was gone. It’s an old white scooter, missing one of the side mirrors, has collector’s plates. If you see anything, please let me know ASAP – lots more sentimental value than anything else. Many neighborhood/community groups skip August meetings. This month, the Admiral Neighborhood Association is an exception. But it’s not a regular-format meeting – ANA president Larry Wymer has announced that the ANA will meet at newly opened Aegis Living of West Seattle (WSB sponsor), and you’re invited to join the sneak-peek tour (including the tugboat shown in our top photo from its July installation), in advance of the August 25th grand opening. Be there – 4700 SW Admiral Way – at 6:30 pm Tuesday (August 14th). Love the West Seattle Farmers’ Market? It doesn’t just spontaneously happen every Sunday … it, and counterparts around the city, are run by the Neighborhood Farmers’ Markets, whose annual fundraiser is coming up. WS market manager Sam Kielty asked us to extend the invitation to you to get tickets for “An Incredible Feast,” 5-8 pm September 23rd at the Center for Urban Horticulture (3541 NE 41st). The food and beverages come from local farmers, chefs, breweries, and wineries – see some of them listed here. “Incredible Feast” proceeds also support the farmers via the Good Farmer Fund. You can get your ticket(s) here. 1:07 PM UPDATE: The incident commander tells us they don’t believe anyone was at the home when the fire started. The cause is under investigation. What’s up for the rest of today/tonight? Check our calendar! | Comments Off on What’s up for the rest of today/tonight? Check our calendar! Plus – the city says its Sunday-schedule wading pools ARE open today. 8:55 AM: Texter says orcas are northbound, passing The Arroyos – midchannel, at least three whales. 10:04 AM: Another texter says the orcas are now reported to be north of Blake Island, “at least five orcas, crossing north of the midchannel buoy.” Also, we’ve added a photo from the first tipster, Chris Frankovich.